People are falling to their deaths off the Gotham Gazette building. They are not suicides; they are being thrown off the roof by Joker and his band of crazy men. (I know, Jerome has not taken on the Joker mantle yet, but I can’t help it – he is the Joker, and he plays the part terrifyingly well.) Each kidnapped man was taken from the shipyard, strapped into straightjackets, with letters spray painted on their chest. After careful tossing, when on the ground, the bodies spell out Maniax! Theo is proud of his Maniax, but he wants them to be a little theatrical, and start prepping for television appearances. An informal audition shows that Joker is the best spoken of the bunch. Robert Greenwood, a cannibal, challenges Joker’s place, so Theo deems they resolve it with a game of Russian roulette. Robert takes the first pull – nothing. Joker takes the second… and third… and fourth. Nothing. It is a five-round chamber, so Joker wins. Theo has big plans for his Maniax. While at the shipyard, they also stole a full fuel truck. Joker decides they are going to target a yellow school bus filled with cheerleaders. The Maniax cut off the bus, cuff the cheerleaders in their seats, and start filling the bus with fuel. Joker’s lighter isn’t working, so he asks the cheerleaders for a light. Fellow Maniax Arthur has one, but before they can light the bus, the cops roll up. The Maniax open fire on them, and two of the Maniax get the truck going, and Joker hops on board. They roll out, leaving Arthur to try to set the bus alight. Jim Gordon is at the scene and punches out Arthur as he lights the trail of fuel. Jim boards the bus and drives it away from the flames so it doesn’t ignite. With the rest of the police force rolling in to clean up the scene, Jim tries to get answers out of Arthur. He will talk, but only after he is promised immunity. Just then he is killed by a sniper’s bullet. Tabitha takes him out from a rooftop and quickly disappears. No loose ends. Back at Gotham PD, Jim gets a phone call from Barbara – along with an overdramatic music sting! He tries to convince her to turn herself in, but she laughs, and her laugh echoes through the station. Turns out she is calling from the police station. Once she locks eyes with Jim, she retreats, and he follows her out to an alley. Maniax Aaron is waiting for them, and he beats the snot out of Jim, only stopping on Barbara’s command. “I’m not sick,” she tells her former beau, “I’m free.” She recommends he gets back to work – no telling what happened while he was gone. Just after Barbara and Jim left the station, a group of uniforms rush in. Joker leads up a crew of ancillary Maniax, who start shooting up the station. Joker holds Essen hostage while the rest of the lunatics shoot up the bullpen, hitting anyone that moved. Ed, acting on instinct, saves Miss Kringle and gets clipped in the arm. Lee hides beneath her autopsy table and avoids discovery. Most of the rest of the people in the police station are dead. Joker swears to Essen that he will leave his mark on the city. Robert cuts in and says, “There is nothing more contagious than laughter.” Joker, annoyed that he took his line, shoots him dead. Essen is shocked and spits in Joker’s face. “That is surprisingly enjoyable,” he remarks and asks her to do it again. By the time Jim arrives at the station, the massacre is over. Most of the squad is dead, and the Maniax are gone. Essen has been shot, and with her last breath, she tells him, “It’s a new day, Jim.” Later, while Jim is mourning Essen in her office, Bullock shows up. Jim had visited him earlier in the episode to ask him to come back to the force. Bullock was enjoying his civilian life too much, and is engaged to Scottie, who vehemently did not want Bullock to go back. But after Bullock heard about the police massacre and the death of Essen, he knew he had to return to the force. Bruce is getting ready to turn on his father’s computer. Alfred strenuously begs Bruce not to. Among Thomas’ belongings are a fridge filled with bagged blood, an arsenal of guns and weapons, and a bullet-proof vest with a couple of shells in it. Bruce ignores Alfred’s pleas and boots up. In a moment of madness, Alfred takes a hammer to the computer, destroying it. He insists he is trying to protect Bruce, but Bruce is furious. He fires Alfred and tells him to leave and never return. Apparently, they both forgot that Alfred is Bruce’s legal guardian – can’t be fired from that. 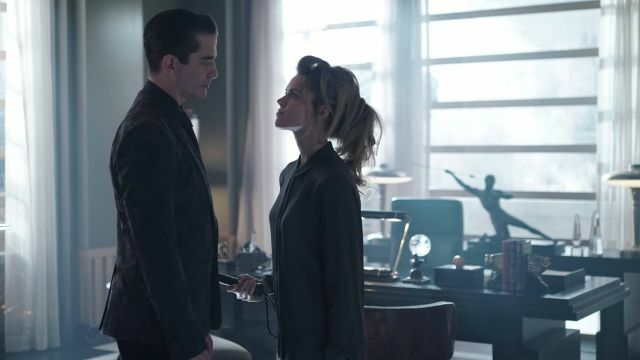 Alfred says a tense goodbye, hoping Bruce will change his mind. He doesn’t, but Bruce does show up at the train station with an apology: “I understand you were trying to protect me, but there is nothing you can do to stop me. I don’t want you to go, but you are either with me or against me.” They finally come to an agreement. Alfred will return to Wayne Manor and teach Bruce how to be tough, how to fight and handle weapons and all that Batman goodness. He will even go back to school. Alfred agrees, but only if Bruce follows his instructions and curriculum exactly. Bruce agrees, but he has one final term: Alfred must fix the computer he broke. Which leads Alfred to Lucius Fox. He meets him “by accident” at a bar, tells him some ridiculously British story, and admits he wants to confide in Lucius if he can trust him. He blames Lucius for his “predicament” with Bruce, but Lucius is in. Alfred brings him back to Wayne Manor, and Lucius sets about fixing the computer. He built it for Thomas, but Thomas didn’t tell Lucius anything; he just helped with his tech. Lucius admits he loved Thomas Wayne, and regrets not telling him that. Helping Bruce is the only way he can show his love for the Wayne family. This episode was great. 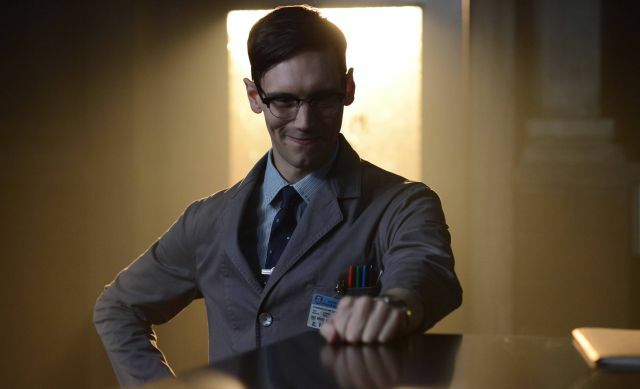 The first season was all over the place, introducing new villains nearly every week. Batman is known for its rogue’s gallery, and Joker is easily the most notorious rogue, so to focus on him and his benefactor is smart. It gives the series, the season, a trajectory, and prevents it from becoming just another procedural. I also like that Joker and his madmen shoot up the police station. It was violent, it was shocking, and it was a nice gut-punch after those saccharine cheerleaders escaped a toasty death. 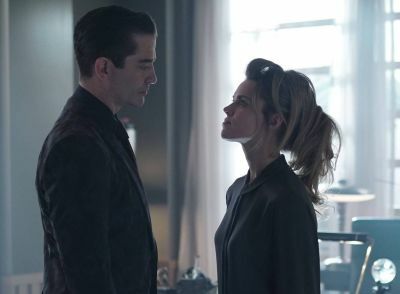 Check out the preview for next week’s all-new Gotham.